Tight space -- no worries! 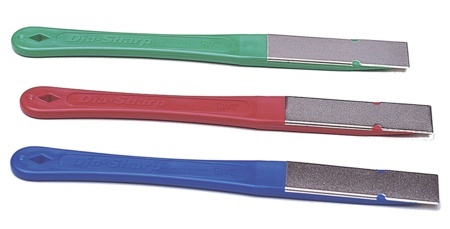 Kit of Dia-Sharp® 2.5” Diamond Mini-Hone® sharpener with its ergonomically designed handle provides comfortable sharpening, deburring and honing in tight spaces. Easy access tip measures .033” thick. Diamond surface measures 2.5" x .75". Three different diamond stones included: Extra-Fine to polish and refine an edge, Fine for a razor sharp edge and Coarse to transform a dull edge.